We on Earth are subject to the same rules of the elements earth, water, air and fire as other forms of life. The life in all realms of nature is dependent on the forces at work there: the elemental beings and nature spirits. These forces of the ether world are usually associated with plants and minerals, but our bodies also are affected by these spirits from the ether, from of the astral worlds of the zodiac, and by the spiritual Forces from the planetary spheres, that make our existence on Earth possible. A nature spirit of the highest order, our body spirit, controls our energy or life force. It bears our memory, watches over our health and gives us our resilience. 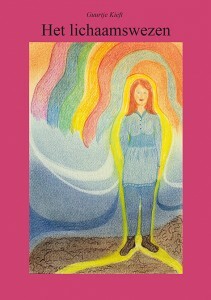 In this book, Guurtje writes about her experiences and conversations she had with her body spirit.